The OED lists ‘sphairistike’ as the name under which a certain Englishman, Major Walter Wingfield patented the equipment and rules for a new outdoor racquet and ball game in 1874. Wingfield's word (pronounced 'sfee-ris-ti-ki) was a shortened form of the Greek phrase sphairistike techne, meaning 'the skill of playing with a ball' and his game combined elements of earlier pastimes (the net from badminton, the ball from fives, and the scoring from rackets). The name didn't catch on but the game did. We know it better as lawn tennis. Racquets from the earliest years of sphairistike or tennis, distinctive for their long slim handles and pear-shaped solid (rather than laminated) ash heads, are among the most desirable and hardest to find of all sporting collectables - but Ludlow saleroom Mullock's (17% buyer's premium) have offered two in as many sales. Both were from the same vendor and, although different weights, may have been part of a pair made c.1875. According to the late tennis historian, collector and author, Tom Todd, sphairistike racquets were offered for sale in boxed sets of different sizes in the hope of encouraging the whole family to take up the game. Within a year, Wingfield's equipment sets had been sold for use in Russia, India, Canada, and China. The racquet offered by Mullock's last December weighed 265 grammes and sold for £3200. That offered on April 6-7 was lighter at 225 grammes and in excellent condition with only a tiny crack near the bottom of the walnut wedge and its original gut stringing (just three broken) and period white sheepskin grip. Estimated at £1500-2000, bidding reached a punchy £5000. The much older indoor game of rackets - which began as an 18th century pastime in London's King's Bench and Fleet debtors prisons before becoming codified at Harrow - received more than an honourable mention at Graham Budd's (17.% buyer's premium) sale in London on June 1. Any 19th century rackets (or racquets) ball is a rarity, but this one had been used in a championship match in 1887. 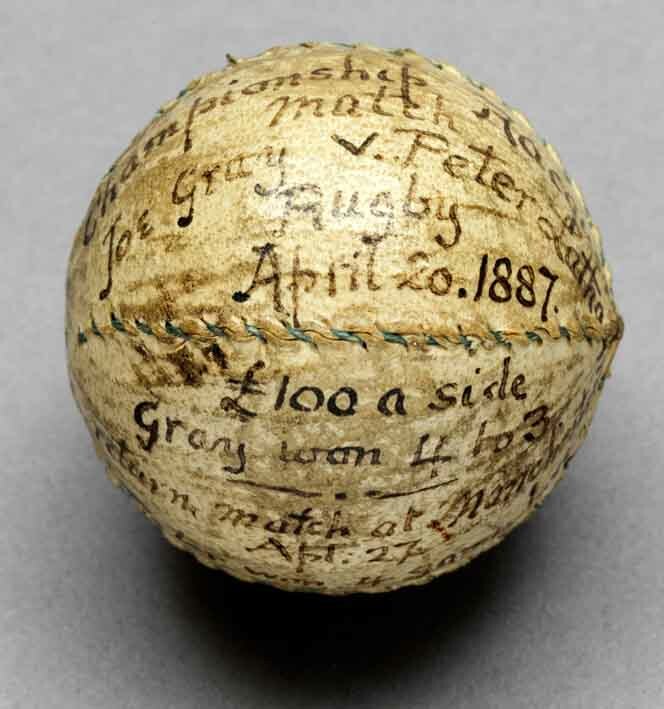 It was inscribed neatly in ink: Championship Racquet Match, Joe Gray v Peter Latham, Rugby, April 20, 1887, £100 a side, Gray won 4 to 3, Return Match at Manchester, April 27, Peter Won 4 Games Love. The name of Peter Latham and the date 1887 are both key. Peter Latham is generally rated the greatest of rackets players, holding the world title from 1887 (perhaps the match in which this ball was used) to 1902, when he finally resigned. He was also world champion in the similar indoor game of real tennis from 1895 to 1905, and again from 1907 to 1908. Housed in a custom made wooden box, this ball sold for £3000 (estimate £1500-2000).